Were Hedge Funds Buying the S&P 500 in the Fourth Quarter? The ETF fell by 14% during the fourth quarter, a massive drop. However, since the beginning of the new year, it has increased by about 10%. Also, it is entirely possible that the funds were merely hedging against their short positions. 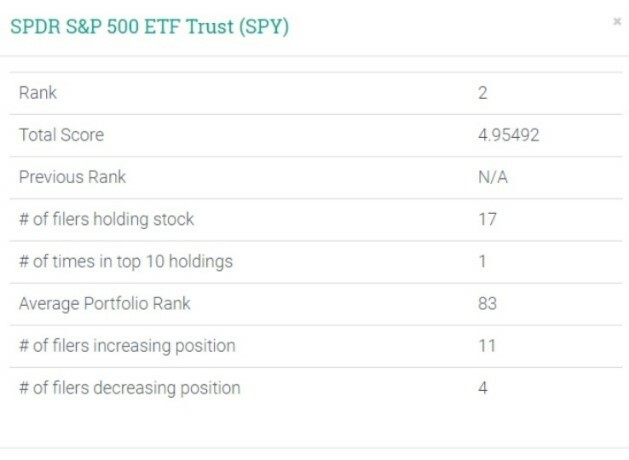 The strong buying interest among the top 150 hedge funds led the ETF to rise to number two on the heat map. It was not ranked in the third quarter on the heat map. 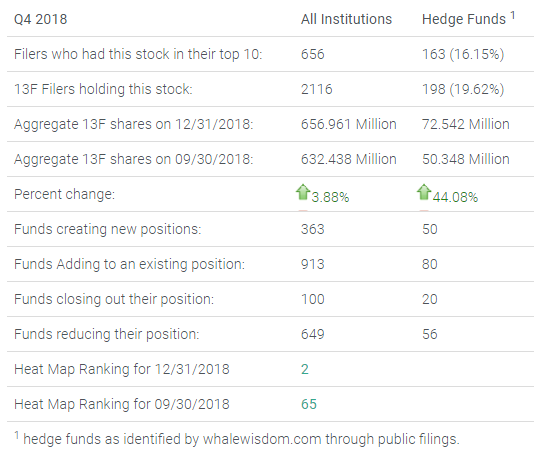 During the fourth quarter, more than 10% of these hedge funds owned the ETF, while 11 funds increased their position as 4 decreased their shares. Overall, institutions and hedge funds were buying the S&P 500 proxy. 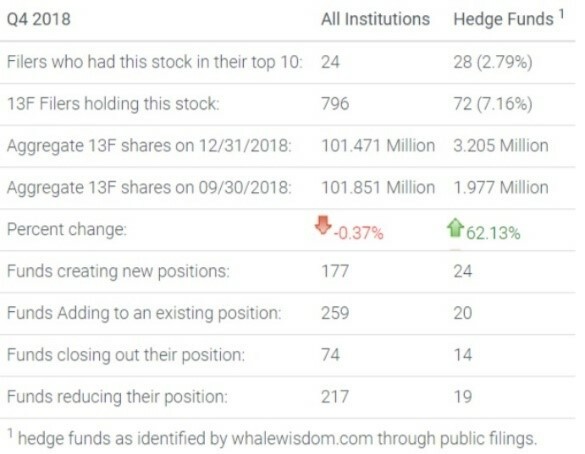 The total number of 13F shares among all hedge funds increased by 44% to approximately 72.5 million shares. In total, 50 of the funds created new positions in the ETF while 80 added to existing holdings. Meanwhile, 56 funds reduced their holdings, and 20 funds exited the ETF. Overall, total institutions were adding to their holdings as well during the steep sell-off. The number of 13F shares increased by about 4% to 657 million. The contrast between the declining indexes and stock prices during the quarter, combined with the buying action in the ETF, is startling. It would certainly not be what one would have expected to have seen. What is also odd is that surprisingly the same action was not taking place in the NASDAQ 100 proxy, the Invesco QQQ ETF (QQQ). Hedge funds were dumping the ETF’s shares, with the number of total 13F shares declining by 33% to 7.96 million. However, total institutions were buying the ETF, with the 13F shares rising by almost 17% to 186.2 million. It is also entirely possible that the S&P 500 ETF share count increase was a hedging tactic. Hedge funds may have been shorting individual stocks as the market was falling while buying the SPY as a hedge. It would help the funds minimize their losses should the stock market suddenly turn higher as they were trying to unwind their short positions. Sometimes in investing what seems to be obvious is not always the correct answer. Perhaps, in this case, the significant increase in the number of shares being bought in the S&P 500 ETF during the quarter had more to do with a hedging technique than being smart. Tesla Inc.’s (TSLA) stock has been one of the most volatile over the past few years. The significant rise and fall of the shares are a direct reflection of the struggles the company has faced as it has ramped up the production of its newest all-electric sedan, the Model 3. Production challenges have resulted in the company swinging between profit and losses for the past two years. As a result; investors have struggled to gain confidence in the stock to push the shares higher. In the fourth quarter of 2018, investors were eagerly adding to their holdings of the stock on hopes that the company had finally turned the corner for the better. 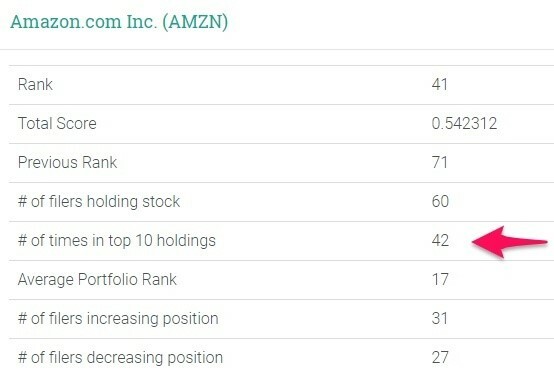 Additionally, the stock was added to the WhaleWisdom 100 Index on February 15 as a result of the buying activity in the fourth quarter. Among the most significant additions during the quarter were from the Saudi Arabia Public Investment Fund, which added nearly 8.3 million shares, bringing its total holdings to 4.8% of the company. Additionally, Capital World Investors added nearly 1.8 million shares, bringing their total holdings to 8.6 million, and they now hold over 5% of the company. 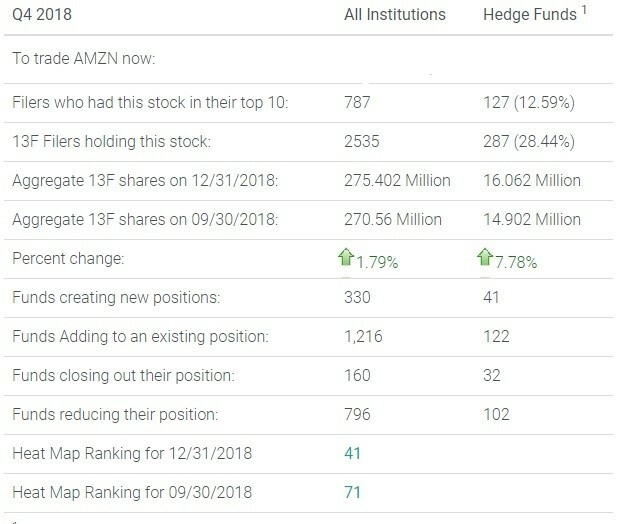 However, not every institution was buying during the quarter. One of the stock’s biggest holders, T. Rowe Price Associates Inc., cut its position in half to 8.9 million shares, reducing its stake to just 5.2% of the company. Meanwhile, the Bank of Montreal sold almost 3 million shares and nearly exited the stock entirely, now holding less than 300,000 shares. 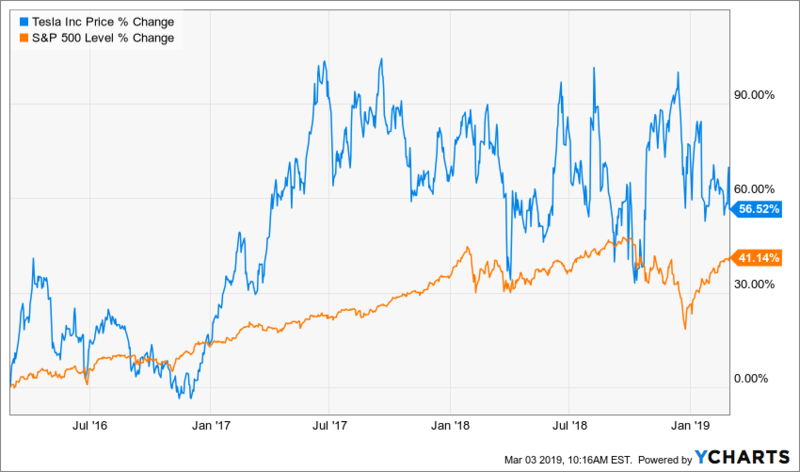 Tesla continues to be a hotly contested stock between the bulls and the bears, which is likely one reason why there was such a significant shift among its top holders in the stock during the quarter. If one thing is clear, it is that Tesla continues to ramp-up the number of Model 3’s it produces each week. According to the Bloomberg Model 3 tracker, the company is quickly approaching 6,000 Model 3’s per week from just 400 per week at the same time a year ago. While the company continues to push the envelope on the production of its cars while implementing cutting edge technology, the debate will continue to rage on, whether the company ever reaches its goal of creating cars for the masses while achieving profitability. The Baker Brothers Advisors LP were busy adding to their portfolio in the fourth quarter, while most investors were dumping stocks. The fund was aggressively adding to existing holding while also initiating several new positions. However, despite significant additions, the fund sold a substantially low number of holdings. The stark contrast between the buying and selling throughout the quarter would at least suggest that the fund was taking advantage of the falling prices in the equity market. 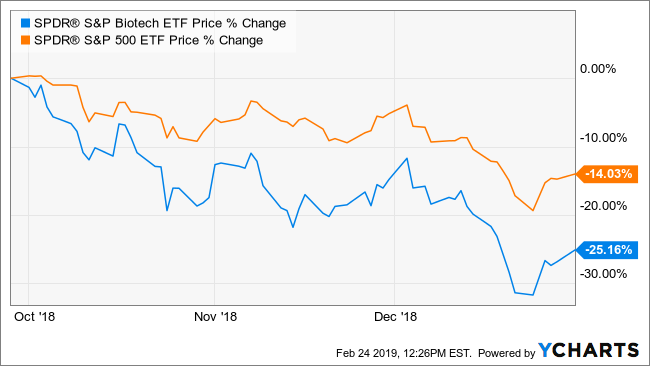 Biotech stocks were one of the hardest hit sectors during the market downturn, with the SPDR S&P Biotech ETF (XBI) dropping 25% versus the SPDR S&P 500 ETF (SPY) decline of 14%. During the quarter the Baker Brothers added 11.3 million shares to their already significant stake in Acadia Pharmaceuticals, Inc. (ACAD). The Bakers raised the total number of shares held to 39.7 million shares or 31.7% of the company. The dollar value of the holding is now worth $650 million, and it places the stock amongst the fund’s top-10 holdings. Acadia held a secondary offering in November, of which the Bakers acquired many of the newly issued shares. The Baker Brothers also increased their stake in Amarin Corp. PLC ADR (AMRN) by 25%, buying an additional 8.5 million. The Baker Brothers now own about 13.2% of the company, or 42.6 million shares, a value of about $579.7 million that places it right behind Acadia in the portfolio. Amarin’s shares rocketed higher in November after data showed its drug Vascepa reduced the number of cardiovascular events. During the fourth quarter, the Baker Brothers started a new position in an initial public offering Kodiak Sciences Inc. (KOD), which is working on treatments for retinal diseases. The fund bought 9.1 million shares of the stock, a value worth about $65 million. It gives the Baker Brothers a massive 24.4% stake in the company. Despite all the additions to the portfolio, the Baker Brothers did very little selling during the quarter. The most prominent position they sold during the quarter was their stake in Sage Therapeutics, Inc. (SAGE), which had a value of $80 million at the end of the third quarter. Additionally, they sold out of their $9.3 million holding in Erytech Pharma SA (ERYP) at the end of the third quarter, as well as holdings for Momenta Pharmaceuticals, Inc. (MNTA) and Ovid Therapeutics Inc. (OVID). 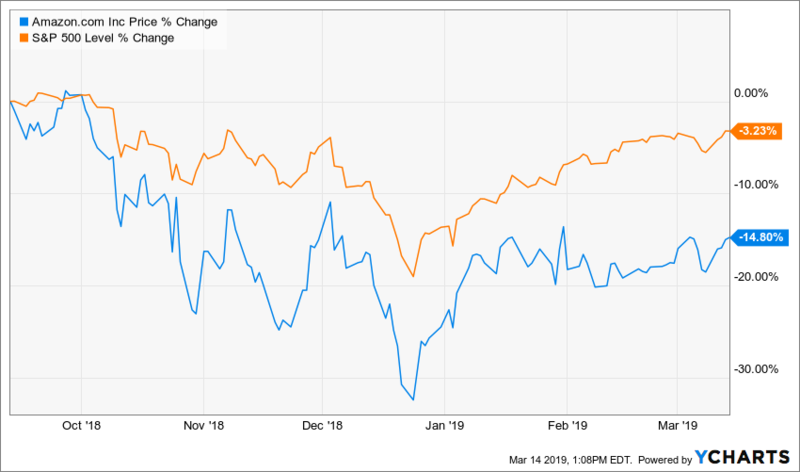 It seems that the steep pullback in the equity market in the fourth quarter had a minimal impact on the Baker Brothers’ psychology. It even looks as if they may have used that volatility in the market to opportunistically buy stocks. Only time will tell if it was the right call. 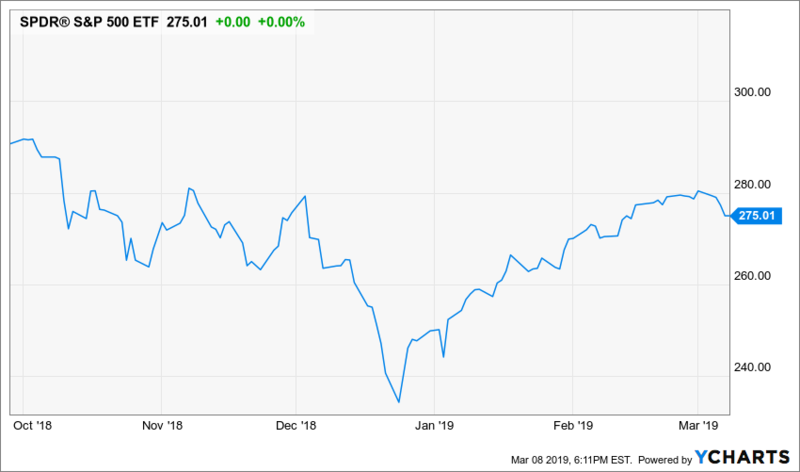 The world-renowned investor, Warren Buffett, and his Berkshire Hathaway Inc. were hard at work in the fourth quarter, reducing their stakes in Apple Inc. (AAPL) while loading up on the bank stocks. However, Buffett did reduce his exposure in Wells Fargo & Co. (WFC), which has faced many problems when it comes to compliance practices over the past few years. During the quarter, Buffett bought shares of JPMorgan Chase & Co. (JPM), Bank of America Corp. (BAC), U.S. Bancorp (USB), and Bank of New York Mellon Corp. (BK) Additionally, Berkshire grew its stake in General Motors Co. (GM) by nearly 50%. Dumping Apple, Not So Fast? What may have been the biggest surprise, and likely has some investors scratching their heads, is why Berkshire reduced its stake in Apple. According to the latest filing as of December 31, Berkshire reduced its stake in Apple by 2.9 million shares to 249.6 million shares. However, what is not clear is why a 13G filing shows they own 255.3 million shares for the same event date. That is more than the reported 252.5 million they owned at the end of the third quarter on their reported 13F. It could be that not all of the entities that Berkshire controls reported their stakes on the 13F but were included in the 13G. It would raise the question at the very least as to whether Berkshire sold any stock in the quarter. Berkshire was also busy finishing what it started in the third quarter, scooping up shares in the big banks. During the fourth quarter, Berkshire added nearly 14.4 million shares of JPMorgan, raising its stake to 50.1 million shares. Meanwhile, they added 18.9 million shares to their already tremendous stake in Bank of America, raising total holdings to 896.1 million shares, a $22.0 billion position. They also increased their positions in Bank of New York Mellon and US Bancorp by roughly 3 million and 4 million shares, respectively. What comes as a surprise is that the firm increased its stake in struggling General Motors. Berkshire added nearly 20 million shares in the quarter, bringing its total share count to 72.2 million. It’s an unexpected action given that GM has seen sales slip in recent quarters at what many felt may be the peak of the current auto market cycle. What is not surprising is that Berkshire sold nearly 16 million shares of Wells Fargo in the quarter, reducing its holdings to 426.8 million shares. The bank has been in the middle of many scandals in recent years, including the fake account scandal in 2016. While Berkshire made many significant changes to its portfolio, what seems abundantly clear is that Buffett and Berkshire are not shying away from the banks. Even in the face of a horrific 2018 for the financial stocks, Buffett had no fear, being greedy when others were fearful.